On Monday, I went to visit the Sisters at Fraternite Notre Dame, a convent in the Austin neighborhood on Chicago’s far west side. FND was one of the first flour recipients – back in early July, they took a ton of all-purpose flour to use for their food pantry and kitchen. Not only do they run a soup kitchen, they fund the soup kitchen by selling French pastries – tarts, croissants – at farmers’ markets around Chicago (The pastries turn up in the soup kitchen too). I’d been wanting to see their operation all summer and finally, during my last week in Chicago, we were able to arrange a visit. Having worked with nuns in the past, I am never quite sure what to think of them. Put mildly, they’re a throwback to another time, and these nuns, not only nuns but French, seem especially out of place. I hold pretty negative opinions about the Catholic church, but did want to acknowledge the strong commitment to service that these women have. And all of this made me even more curious to check out what went on in their kitchen. FND, like most of the other agencies I’ve talked to and visited, have seen the number of people in their soup kitchen line grow and grow over the last few years. 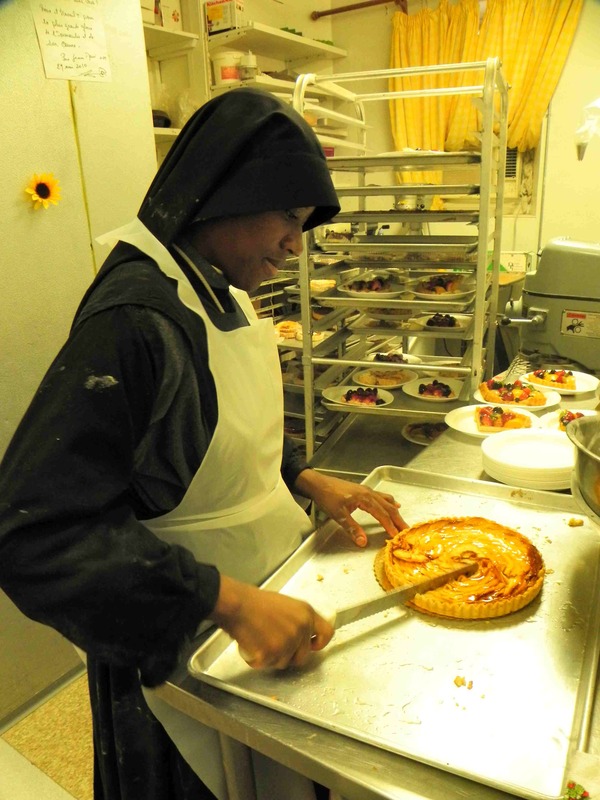 The nuns start their day early in the morning with mass, then cooking in the soup kitchen, then serving and cleaning up (people line up for lunch starting at 10 am; lunch starts at 11 and goes till 1). Once that’s done, they begin making pastries. Sometimes they work till midnight, sometimes even later if there’s a market the next day, because the pastries need to be fresh. They go through about 400 pounds of flour a week. 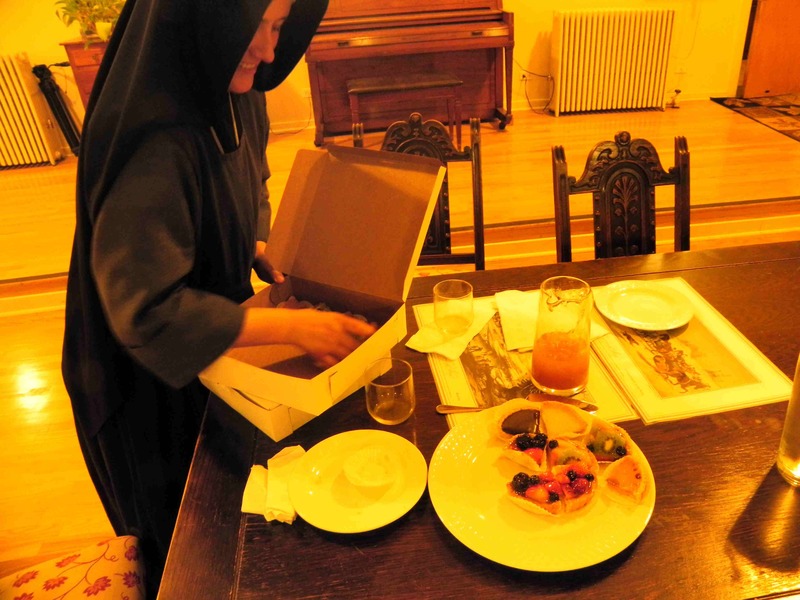 As part of my visit, Sister Marie brought me to an upstairs dining room where there was a table set with some juice and a platter of a dozen or so small pastries in white paper nests. For me. I was a little dumb-founded – charmed by the decidedly European-style over the top hospitality and the beautiful treats, foggy with a killer head cold, and feeling a little dash of guilt brought on by knowing that in the dining room just below me, people were eating what might be their only meal of the day. It was a little uncomfortable to be treated like such an important visitor, but I do like pastries. I did happen to be hungry. And I didn’t want to be rude, so I wolfed down several as I told the Sister more about the story of the flour and where it was all coming from and tried to emphasize that I’m not rich or anything. Then the rest of the pastries were packed up in a little white box, and another white box appeared – this one with a whole, perfect berry tart – and was placed into my arms. The nuns showed me politely to the door, and there I was, all sugared-up, back on the streets of Austin. Well, as you may or may not have heard, I’m in the midst of my final week in Chicago. That was fast, wasn’t it? Just a couple weeks ago, I was wondering what on earth I was going to do with the 5 tons of flour that was still in the warehouse. About a dozen people responded to my email query with their ideas and contacts, and whaddya know – it’s all been spoken for now. Many months ago, back in Seattle, I was on the phone with Ben Walker and he mentioned that one of the things he was finding interesting about this project was that it seemed to embody the old adage “many hands make light work.” With everyone doing just a little bit, whatever they can, the Industrial Harvest has been made possible. People have been asking me whether this project has turned out to be what I’d envisioned. And although it has, it’s also been so much more, mostly because of what others brought to the table. So you should be very proud of yourselves! Together, we’ve fed a lot of people. Many of those were people who were hungry. Others may not have needed the food itself, but were perhaps in need of what the food represented – support, caring, appreciation, friendship. I’m under no illusions that a bag of flour is going to keep someone from losing their job, or from being kicked out of their home. It won’t address any of the numerous underlying problems in our society. But, as a formerly-homeless friend told me long ago, with these small gestures we can keep people from feeling invisible, and make them feel like someone cares about them. Over the last couple of weeks I have been riding the emotional roller-coaster – so happy to be returning home to Seattle, to my husband, our cat, and our extended Seattle family. And so sad to be leaving Chicago, the Midwest, and the inspiring network of people I’ve gotten to know and love over the last few months. I have been just overwhelmed by the welcome that y’all have given me – it’s made being here such a joy. So although saying thank you doesn’t seem to capture the depth of my gratitude, you have my most sincere thanks. Back in August, I met N.,who came to the reception at Roots & Culture hoping to take some flour back to Jamaica to give away on an upcoming trip. She thought it would be a provocative commentary in that island nation, as the recent increases in food prices had had severe impacts on the people there. N. told me that the government just passes along price increases to the consumers, even though it has the power to do otherwise. Like many Caribbean nations, Jamaica could easily be self-sufficient in terms of food, as it’s blessed with a year-round growing season and many native sources of nutrients. But instead, it’s been sold down the river by corporations/governments focused on growing commodities (such as sugar cane) for export, undermining its food security – particularly in tough economic times like these. So, together with the patient and flexible Mike Wolf, we arranged for N. to pick up a 50-lb bag from the Roots & Culture show and take it with her on the plane. I hadn’t heard from her much since, but I caught up with her when she came to the commodities trading session at Mess Hall. She broke the bad news to me: “It didn’t make it. I’ve got the day off on Thursday. I’ll come by and tell you the whole story.” Read what happened to her, in her own words, here – it’s a great lesson in creative adaptability under pressure. Speaking of adaptability, check out the newly updated list of upcoming Industrial Harvest events. Both Mess Hall sessions have now been rescheduled for Oct. 10 (this coming Sunday, 11 am – 1 pm) and Oct. 24 (another Sunday, 3 – 5 pm). Join us!